You may know that at the very end of the Jewish wedding ceremony, the groom breaks a glass. But what exactly does that tradition mean? There are about as many explanations as there are post-stomp shards of glass, but we’ve collected our favorites for you below. Traditionally, the glass is broken to recall the destruction of the Temple. The Hebrew pledge, “Na’aleh es Yerushalayim al rosh simchaseynu,” translated to mean “We will raise the destruction of Jerusalem above our rejoicing,” reminds us that even in the happiest of times, we must remember the loss of the Temple. Similarly, the breaking glass can serve as a reminder that life can bring sorrow as well as joy. The commitment of marriage must survive the good and the bad, the easy moments and the hard ones. During the most joyful part of the ceremony, the bride and groom remember to honor their commitment through whatever hardships the future may bring. Some believe that the breaking of the glass symbolizes the fact that marriage will permanently change the lives of the bride and groom. Once the glass is broken, it cannot be made whole again. The couple’s lives are now permanently different and out of the shards their new lives will begin. Others may take the breaking of a glass as a demonstration of the fragility of human relationships. Just like glass, a relationship can be easily broken. It is a reminder to the bride and groom that a relationship needs to be cared for and protected in order to survive. The breaking of the glass can also symbolize the breaking down of barriers between the couple. This explanation especially resonates with interfaith couples that wish to destroy the divisive walls of faith and culture within their marriage. •	Talk to your fiancé about which explanation(s) you identify with the most. If none of them resonate, create your own special meaning. 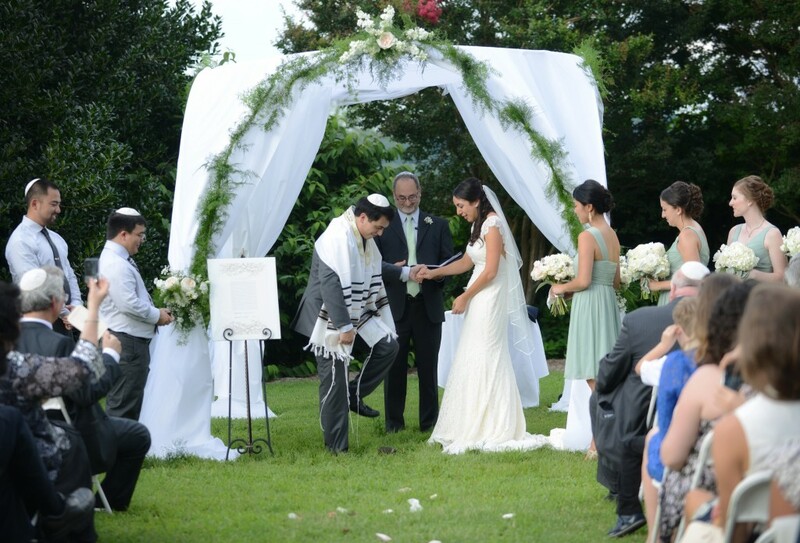 •	Ask your rabbi or officiant to use your preferred explanation(s) during the ceremony. •	Use a very fragile glass wrapped in a cloth bag. Many people use a normal 40-watt light bulb and Crown Royal bag, but there are also special kits you can buy. •	If you’re worried about the glass breaking, practice makes perfect! Nothing is more embarrassing than a groom who can’t break the glass on his first try. 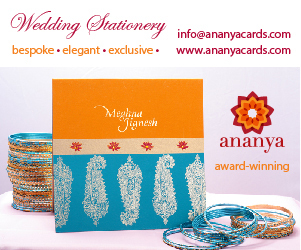 •	Make sure the groom’s soles are thick and the cloth bag is sturdy. No one wants to have to get stitches on the day of the wedding! •	Angry the groom gets to have all the fun? 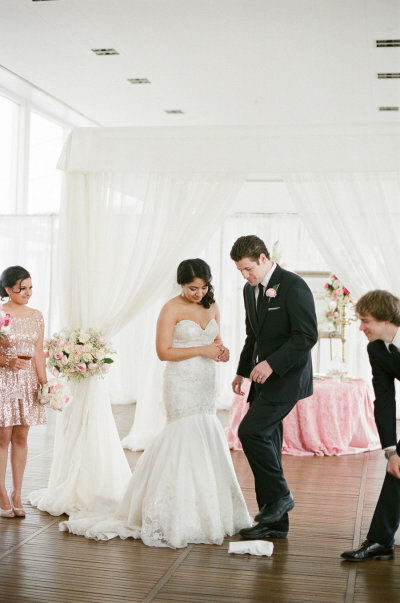 Stomp on the glass together or get two separate glasses for the bride and groom to break at the same time! •	Save the shards. Many companies make mezuzahs or other pieces of art you can display in your home. Which explanation is your favorite? 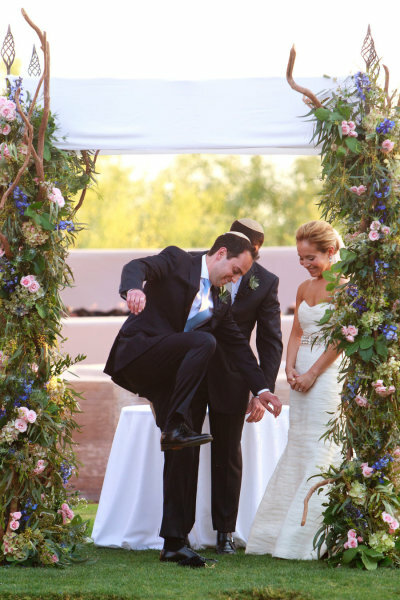 This entry was posted in Jewish Wedding Tips and tagged smashing the glass.